Photo courtesy of Jesús Pino Photography. Charlottesville, VA, Oct. 27, 2015 – St. Anne’s-Belfield School will host the inaugural Charlottesville Girls on the Run Celebration 5K on Sunday, November 15. More than 150 area girls between the ages of eight and 13 will come together to complete the race and celebrate a successful fall season. 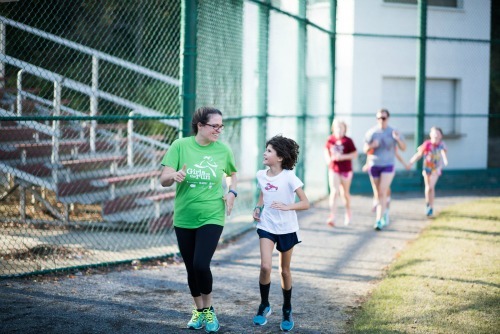 St. Anne’s-Belfield School became affiliated with Girls on the Run in 2012 when a sixth grade team of Girls on the Track participants began practicing together, and in 2014 the first Girls on the Run team for third and fourth grade girls formed. This fall the third and fourth grade team reached it’s maximum limit of 20 participants, and a wait list had to be instituted due to continued interest. The School team practices twice a week, and each of the sessions begin with stretching and a warm-up activity related to a daily topic. Often the activity involves a relay, and topics have ranged from navigating social cliques to putting an end to gossip. The girls also design and implement a service project at the end of their season. Last year they volunteered at the Hoos Heal 5K. The inaugural Girls on the Run 5K will begin at 2:00 p.m. on November 15, with a start at the St. Anne’s-Belfield School football field, 799 Faulconer Drive.